The human sense of self is one of the defining characteristics of our species. Since the early 2000s, a large body of research has identified a system of brain regions that seem to serve self-referential processing. However, this same network serves a variety of other psychological phenomena that are not specific to self-representation, including those for social cognition, affective processing, memory, and sensory integration. To what extent can we disentangle some of these functions underlying various aspects of self-representation? Our previous research has linked elements of self-evaluation to structural and functional properties of the brain’s reward system using diffusion tensor imaging (DTI) and multivariate functional magnetic resonance imaging (fMRI). 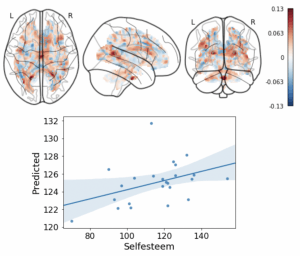 Building off our initial work, disambiguating some of issues of the brain’s representation of self-referential cognition is one of the primary pursuits of the lab. The self does not exist in a vacuum and humans are a fundamentally social species. As such, our brains have evolved systems to detect, represent, and react to conspecifics and socially relevant information in the environment. Some of the principal questions in the lab concern the way in which the brain codes for information about the traits and motives of other individuals as well as the interplay between the self and the social environment. Do we use the same brain systems when evaluating ourselves as we do when evaluating others? To what extent does the closeness or similarity of others to your self color your perceptions of them? What are the psychological dimensions of social information encoding and how do these evolve over time? We explore some of these questions by combining fMRI with round-robin interpersonal perception designs, using naturalistic stimuli (e.g. movies), and employing computational modeling techniques. Despite humans possessing seemingly universal capabilities to process information about ourselves and others, there remains a substantial amount of variability among traits, motivations, preferences, and aptitudes among individuals in a variety of domains. 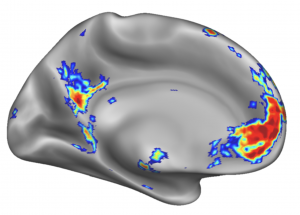 Another line of work in the lab investigates how individual differences in the the structural and functional properties of the brain are related to these psychological dispositions. 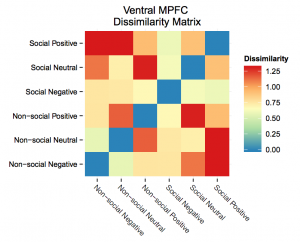 We are particularly interested in how distributed regions and networks of the brain support these individual differences and how they can be used to predict and understand normal variability in these domains as well as risk for psychopathology.